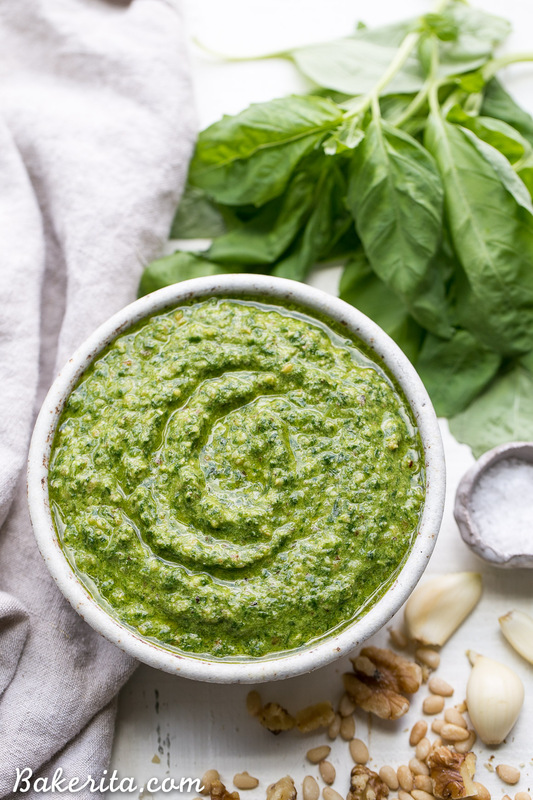 This Spinach Basil Pesto is loaded with bright herby flavor and made in just a few minutes. You won’t miss the cheese in this paleo, vegan + Whole30-friendly pesto. It will make any meal more flavorful, whether it’s tossed with pasta, enjoyed with your favorite protein, or used as a spread. Happy Hump Day!!! This week has felt extra long already, and it’s only Tuesday when I’m writing this…major brain fog. Maybe it’s the gloomy clouds that have been surrounding my apartment for the past four days – at least the rain has finally stopped, though. I’m hoping that the San Diego sun will come back out and say hi, but as most San Diegans know…we’re entering the cloudy months of May and then we’ll be into June Gloom. The clouds are likely to stay around for a little while. It’s alright though, because I can comfort myself with all the spring produce that’s been making it’s way into my apartment. The juiciest of strawberries, vibrant rhubarb, thin asparagus stalks, BIG artichokes, leafy spinach, and tons of fragrant basil have been flooding the farmer’s markets. A bunch of that spinach and basil came home with me, and was begging to be turned into one of my favorite sauces/spreads/condiments: PESTO. 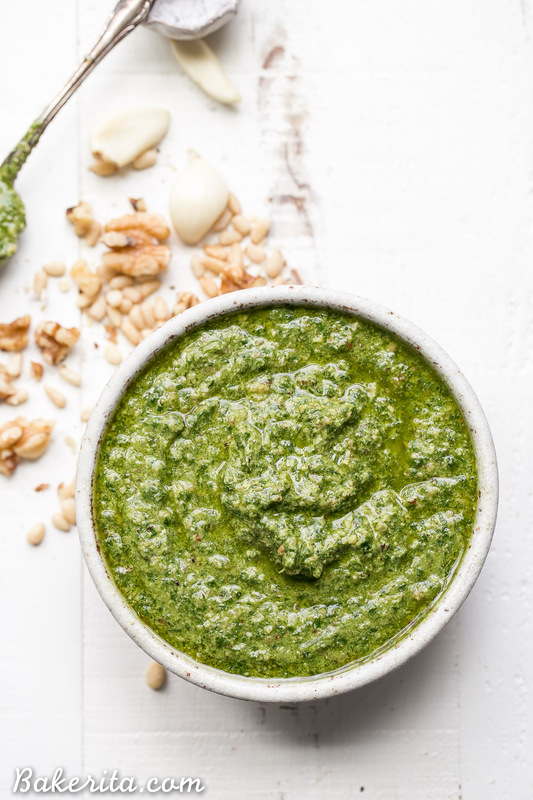 So fresh, vibrant, and absolutely delicious – I can eat pesto with just about anything. Last week, I inquired on my Instagram Stories about whether anyone would be into seeing more savory recipes here on Bakerita. I got waaaay more enthusiastic yeses than I was expecting to, and after chatting with a few people about what they’d like to see, Whole30-friendly recipes were one of the big winners. Since every time I post a picture of my pesto when I’m making or using it I get tons of questions about the recipe, I realized I needed to share it ASAP. 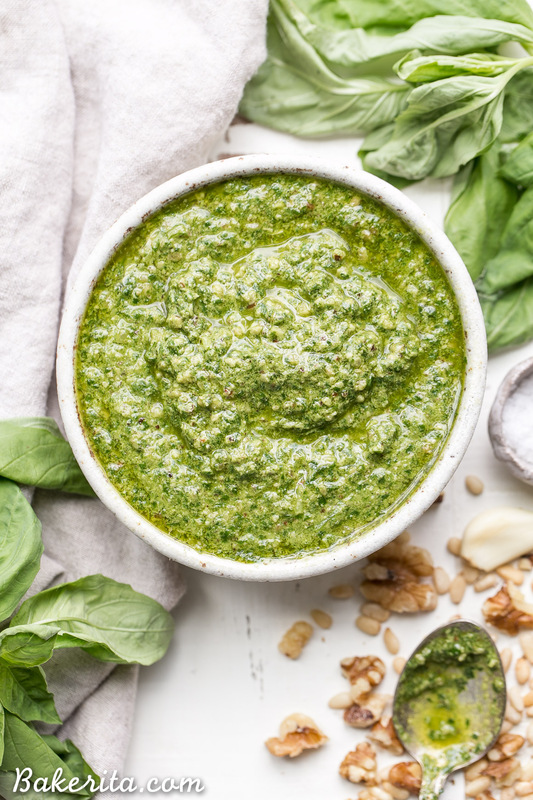 While on the Whole30 I did in January, this spinach basil pesto was a staple of my diet. It made it’s way onto zucchini noodles, as a dip for carrots, and was dolloped in big spoonfuls onto my veggie hashes. Since my Whole30, it’s constantly been in my fridge. One thing I learned doing Whole30 was that dairy was not my best friend, so vegan pestos it is from here on out. I find that most of the store-bought vegan pestos aren’t exactly what I’m looking for, while this one fulfills all my pesto needs perfectly. Instead of adding parmesan cheese, I upped the amount of nuts – a combo of walnuts and pine nuts – and added a bit of nutritional yeast for that cheesy, umami flavor. The nutritional yeast isn’t mandatory though – it’s a more recent addition to the recipe, and I made and LOVED this pesto many, many times without it. The addition of spinach to the basil help adds some bulk to the pesto and a whole bunch of nutrients, but flavorwise, it’s barely detectable. Gotta have some garlic in there too! When I’m using raw, I just add two cloves so it’s not overly garlicky. If I happen to have it on hand though, I love adding 5-6 cloves of roasted garlic. It’s less harsh than raw garlic, and adds such an incredible roasted, garlicky flavor to the pesto. For brightness, lemon zest and juice is essential. I like a lemony pesto, so I squeeze a whole lemon in there. It adds so much vibrance! Besides that, all you need is a good, high quality olive oil. A lot of pesto recipes will use double, sometimes triple the amount of oil that I call for here. I prefer a less oily pesto, so I add just enough for the pesto to blend beautifully. If for some reason I want it thinner and drippier, like for salad dressing or pasta sauce, I’ll thin it out with more oil, lemon juice, or pasta water. For me, this is pesto perfection! Add extra oil and some vinegar to make it a salad dressing. Toss the pesto with pasta, zucchini noodles, or spaghetti squash! Combine all of the ingredients in a food processor or high-powered blender (I used my Vitamix). Pulse on low speed until the ingredients come together. Make sure to scrape down the sides if you’re using a food processor. 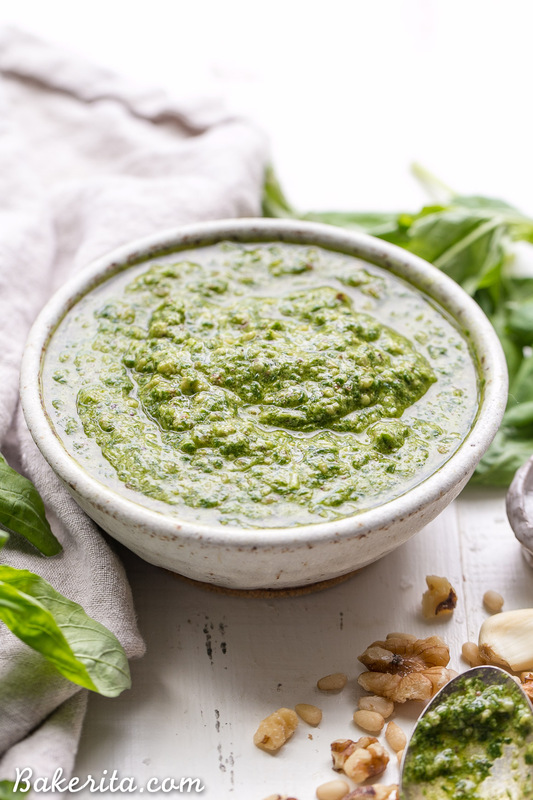 If you’re using a blender, keep the motor on low and use a tamper/scrape down the sides to make sure your pesto doesn’t become too smooth and pureed. You want the ingredients broken up into little bits, but not completely smooth. Taste, and adjust salt, pepper, and lemon to taste. Pour into an airtight jar or container to store. Store in the refrigerator for up to 2 weeks, or in the freezer for a few months. If you happen to have roasted garlic on hand, try substituting 5-6 cloves roasted garlic in place of the raw! SUCH a beautiful vibrant pesto, Rachel!! I would slather this gorgeousness over everything in sight! So perfect for all the upcoming summer salads! 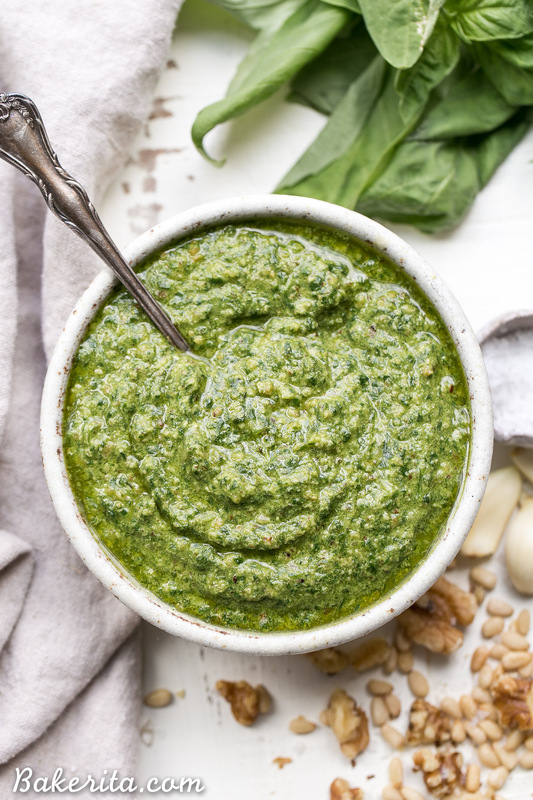 YUM I love pesto, it’s a staple in my fridge and freezer because I’m pretty sure I put it on every dish ;) Have you ever tried making it without pine nuts and using a different nut (maybe all walnuts, or a blend)? Pine nuts are super pricey so I’d be nice to use an alternative when possible! Hi Natalie, I’m a pesto addict too!! Yes I’ve made this with all walnuts before and with a mix of pecans and walnuts, and both are awesome! 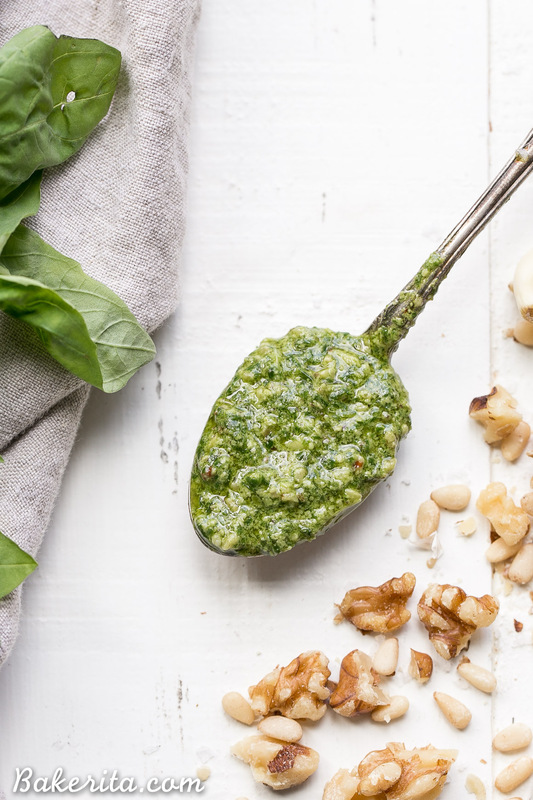 You definitely don’t need the pine nuts for a delicious pesto. Hope you give it a go! This looks so good – and amazingly delicious! 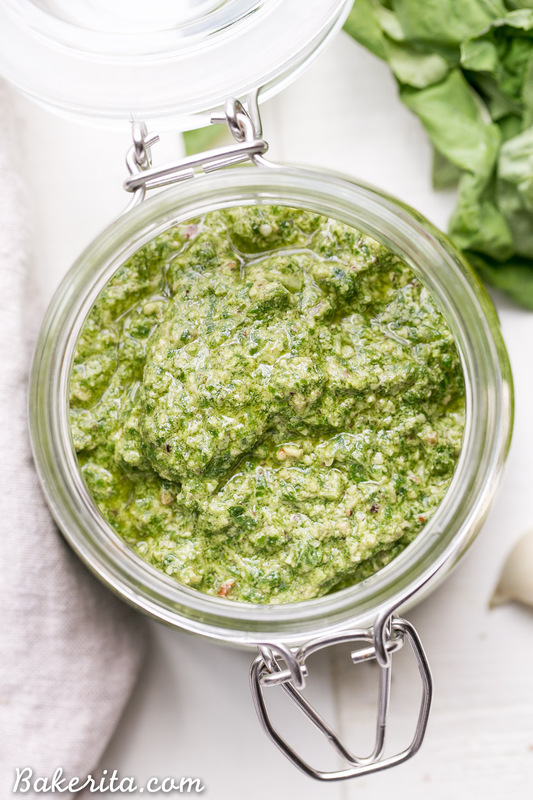 I love a good pesto – it’s so versatile! And this sounds delicious! I love the photos too! SO pretty! How much does this make in the end? I haven’t measured but I think around 2 cups!! I love pesto. Always have to make my own because of nut allergies. What substitute can I use for the nuts? You could use a seed, like sunflower seeds or hemp seeds, or just leave it out entirely!